Our music has absorbed many influences over the years. Some of this comes from other bands we’ve belonged to. Greg, Andrew and David played in the Cambridge Ceilidh band Cobbler’s Last many years ago, playing mostly Irish music. Hazel played in the English-style ceilidh band Ragwort. Mike and Greg both belonged to the bluegrass band The Radio Cowboys; and Greg currently also plays in the New Essex Bluegrass Band. We have also played as Camus, the Cambridge folk band. Greg and Hazel have been closely involved with Shetland music, and founded the Burwell Bash summer school, currently featuring Andy Cutting and Brian Finnegan. We also have a strong link with Northumbrian music. Mike is a renowned pipe-maker, known for making Kathryn Tickell’s pipes. His website, Mike Nelson’s Homepage, contains a wealth of information about pipe-making. He also made the mandolin he plays in the band, and Greg’s fiddle, both of which can be seen in the picture above. David, Andrew and Greg also play the Northumbrian small pipes; and we run an annual piping workshop at the Cambridge Folk Festival (see the page on this site). Many of our dances come from our early experiences in Cobbler’s Last: English dances like The Sweets of May and The Willow Tree; Irish dances like The Waves of Tory and The Drops of Brandy; dances from the North like the Morpeth Rant and the Cumberland Square Eight; dances from Scotland like the Eightsome Reel and the Dashing White Sergeant. We have two callers, unlike most bands: Greg and Andrew take turns calling the dances and playing the tunes (sometimes both!). They’re both expert at building a relationship with an audience, getting people dancing, and teaching the dances with the perfect mix of authority and humour. They’ve even managed to call in rudimentary Spanish and French! We have experience of many situations: we have played the Sidmouth and Cambridge festivals, and gigs across East Anglia. Our longest-standing regular gigs are the Burns’ Night supper at the Human Genome campus at Hinxton Hall, the Victoria Park street party in Cambridge, and the Harvest Festival ceilidh at All Saints church, Milton. Below is a list of some of the venues we have played across the region and beyond. 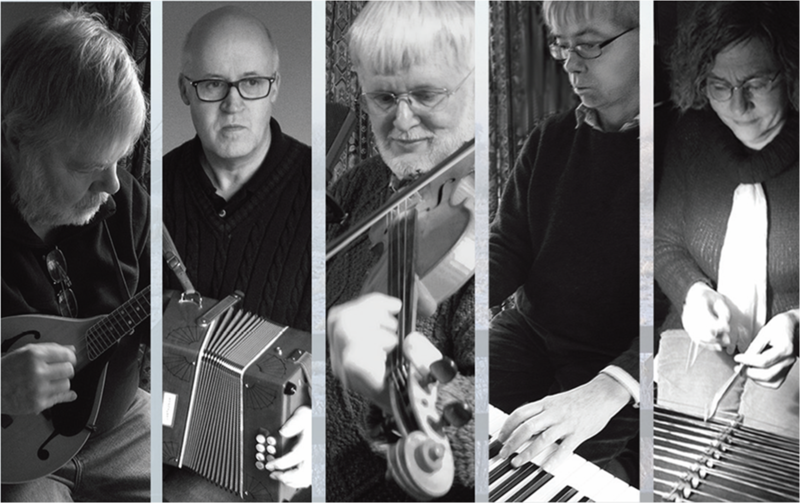 We have played many of the Eastern region folk clubs as Camus; and more recently as GECC, at the Csmbridge Folk Club, the Mayflower Folk Club, and the St Neots Folk Club (in 2017).